I am so pleased to be able to bring you this piece about the uses and properties of the mandragora, ‘mandrake’ plant, by one of the blog’s first adherents, and regular commentator, Laura Diaz-Arnesto, who hails from Uruguay. Laura is a pharmacologist and has offered this piece to give us an opportunity to develop some understanding of an aspect of Byzantine medicine. It is well researched and authoritative. Although some time off this fits well with what I am told will be the subject of next year’s Runciman Lecture which will be on the subject of Byzantine medicine. During their extended and fruitful existence, is obvious to believe the Byzantine Empire had herbalists and physicians that not just adopted (copied), but adapted and discovered numerous drugs and preparations for the treatment of pain and other illnesses, including those containing the somehow mystical, and highly toxic, mandragora root. 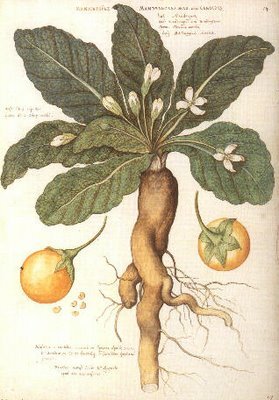 If you were to search the word “mandrake” or “mandragora” in my Pharmacology text when I was studying for my Pharmaceutical degree, you would not find it. It had long been out of Pharmacopoeias and Pharmacology textbooks. Goodman & Gilman’s 6th Edition of “The Pharmacological Basis for Therapeutics” did not mention it at all; though we did heavily study Atropine, Scopolamine, Homatropine and other related Antimuscarinic drugs, generally referred to as belladonna alkaloids. The Mandragora or European Mandrake (Mandragora officinarum) plant is a member of the Solanaceae family that includes Atropa belladonna (nightshade), Datura stramonium (Jamestown or Jimson weed), and other shrubs. The interesting alkaloids they contained have played important roles in history and medicine. Indeed, the mandrake plant was believed to have magical powers. We must remember though all these alkaloids are psychoactive, highly toxic, often lethal substances. The Mandragora plant has been used since Greco-Roman times, and it’s even mentioned in the Bible. Hippocrates noted that a small dose would relieve anxiety and the deepest depression. If drunk its hypnotic properties allowed amputation or cauterisation. It was also used as an aphrodisiac and cure for sterility. Today we know that it contains the psychoactive alkaloids hiosciamine, scopolamine and madragorine (a powerful narcotic and hypnotic, chemically identical to atropine). However, long before its active principles had been identified, it had been used to produce both therapeutic (the mandragora wine was probably the first anaesthetic used in surgery), and obscure and poisoning effects, especially during the European Middle Ages. Both the root and its method of picking were associated with superstition and mysterious popular legends (due to its spindle-shaped root which is often forked beneath, and is therefore compared, in shape, to the human figure). Mandrake root, was supposed to utter a dreadful shriek when pulled from the ground and whoever heard the shriek died. To collect it, a dog was tied to the plant and tempted with meat. Indeed Shakespeare makes use of its properties in many of his plays. My Antony is away.” (Shakespeare’s Antony and Cleopatra, I.v). In what could be called the precursor of modern pharmacopeia, the Greek herbal De Materia Medica by Pedanius Dioscorides of Anazarba in Cilicia, the author describes the mandragora in detail, and explains how wine made from mandragora can induce anaesthesia – in the sense of an absence of sensation – in people about to undergo surgery or a cauterization of their wounds. Dioscorides receiving mandrake from Euresis (discovery). This seminal book written in the first century AD was faithfully studied, copied and quoted for another fifteen hundred years, mainly by Byzantine scribes. One of its more famous copies known as the Vienna Dioscorides can be found in the Austrian National Library; and mandrake is present in two paintings of the frontispiece of this illustrated manuscript completed in 512 CE (also known as the Aniciae Julianae Codex). More than 600 plants and 1000 drugs were described in this ancient pharmacopeia, which remained the standard medical text until the 17th century. More recent studies described evidence on pain relief and sedation for surgical and medical purposes traced in literary medical treatises from the Roman and Byzantine times (2nd century BC to 7th AD). Roman and Byzantine scientists, such as Dioscorides Pedanios, Gaius Plinius Secundus, Galen, Orivasios from Pergamum, Themistios, Aetios of Amida, Ioannes Damascenos and others, referred to Mandragora officinarum, Hyoscyamos niger and Atropa belladonna as the most important herbs, besides the opium poppy, to be used for producing pain relief and sedation. Many other drugs and herbs were extensively used by Byzantine physicians, contributing in this way to the preservation and deepening of ancient pharmacological knowledge. – Goodman & Gilman’s “The Pharmacological Basis for Therapeutics”, 6th Edition. – Rätsch C., Encyclopedia of Psychoactive Plants, Park Street Press, 2005, pg. 796-7. – Ioanna A. Ramoutsaki, Helen Askitopoulou, and Eleni Konsolaki, Pain relief and sedation in Roman Byzantine texts: Mandragoras officinarum, Hyoscyamos niger and Atropa belladonna, International Congress Series, Volume 1242, 2002, pg. 43-50. All figures were borrowed from public domains in the Internet. 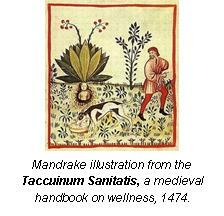 This entry was posted in Byzantine Medicine and tagged Byzantine, Byzantine medicine, Byzantium, mandrake. Bookmark the permalink. This is excellent research I may be a year 12 Student, but this is brilliant a fantastic read, at the moment the Senior Ancient History class I take is studying the Medieval Period, I have selected Byzantine Medicines (originally I did select Medieval Medicine based on the Hemlock and Henbane Ailment used for painful muscles and Laurel Leaves used to cure Jaundice) but since reading your articles on The Magical Mandagora and The Posionous MonksHood, it has inspired me to study and reasearch these Medicinal Qualities throughout the Byzantine Empire. Hi there – I am very pleased that you found the work useful. Please note this is entirely the work of Laura (as mentioned in the article). I will pass on your comments. Perhaps Laura will be able to contact you to discuss further. Thanks a lot for your kind comment. Byzantine Medicines sounds to me as a great topic to study. Is not a well-known subject, and it will profit greatly from further studies. I’ve been navigating the web quite a bit now and can suggest readings for you. For starters I recommend Prof. John Scarborough from Wisconsin University page. He is a true scholar on the subject. Me, I’m just an amateur happy to put together my training in pharmaceutics with the beautiful world of Byzantium.